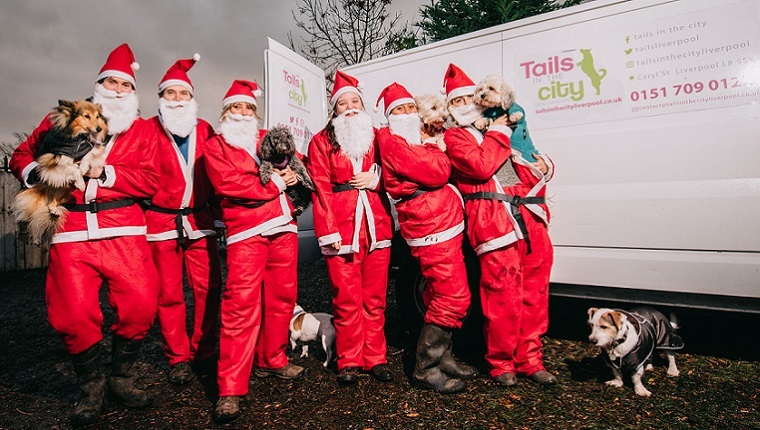 Tails in the City staff are kicking off the festive season in style! We’re running the 5K Liverpool Santa Dash on Sunday 2nd December. Did you know it’s the biggest festive fun run in the UK? What better way to start the countdown to Christmas than by dressing up as Santa and legging it round the city centre with thousands of others? And it’s not just for yuletide laughs (although that too). It’s a charitable occasion because we’re raising money for Shetland Animal Rescue in Halewood. They provide a safe and loving home for over 80 ponies and other animals. Shetland Animal Rescue is a registered charity and is funded 100% by donations and kind gifts. As an example, donating £10 feeds one horse for a week. Then multiply this by over 80 horses which they care for at any one time. As well as the pigs, goats, cats, dogs and chickens. Imagine how much it costs to feed and water all those animals! In addition they need to pay the rent and all those veterinary fees! Please support us by making a donation, however small. In this way you’ll make a real difference to an animal’s wellbeing. We’ve already raised £100 so we hope Tails in the City customers, family and friends will help us bust our £500 target! The Santa Dash starts at 9:30am on Sunday outside the Liver Buildings at Canada Boulevard.